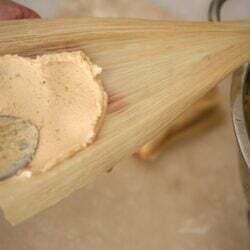 Experience authentic Mexican flavor with this amazing recipe. 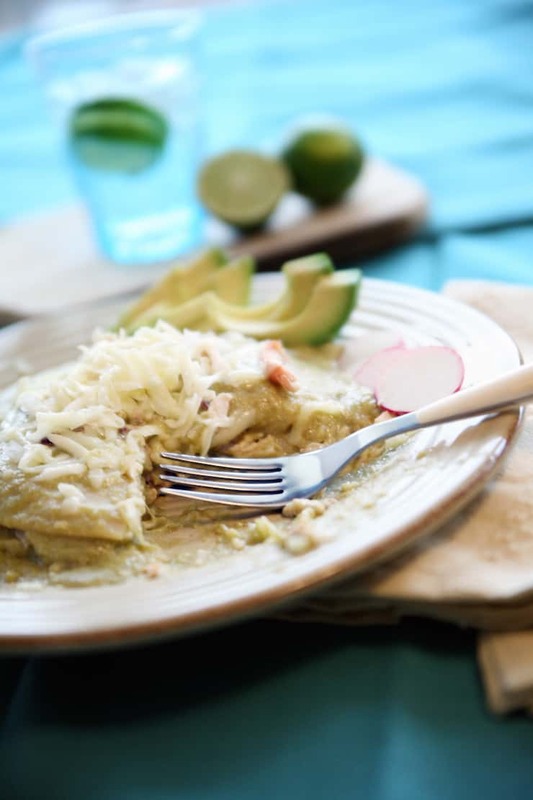 A family favorite created by my mother, Enchiladas Verdes explodes in your mouth with just the right amount of spice and tang. This is my favorite Mexican dish and it’s sure to become yours too. 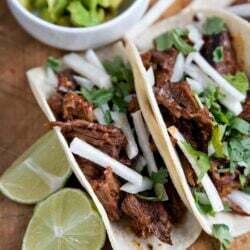 This recipe can also be found in our published Muy Bueno cookbook. 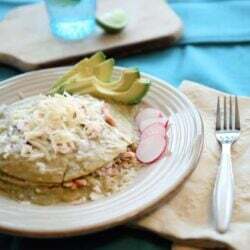 Most green enchilada recipes include canned green chile or a tomatillo salsa. You won’t find any of these in this unique recipe. Our family prefers our enchiladas stacked, but if you are cooking for a lot of people, oven style is the way to go. Stacked or oven style, with or without chicken, you’ll find yourself making this recipe again and again. Preheat broiler. Select firm, meaty peppers without wrinkles for roasting. Wash thoroughly. Place peppers evenly in a single layer on a foil-lined cookie sheet. Place under broiler. Watch them closely as the skin will blister and turn black within minutes. Turn the peppers after 5 minutes to blister all sides evenly. When done, the pepper skins should be evenly blistered and mostly black. Place roasted peppers in a plastic bag, cover with a kitchen towel and when cool, rub off blackened skin, and discard stem. In a blender combine the peppers, flour, and half of the suero or buttermilk and blend until creamy. Pour mixture into medium skillet and set over medium-low heat to warm. Add additional suero or buttermilk and stir. Taste and season with salt, usually about 2 teaspoons. If the sauce is too spicy, add ¼ cup of crema or sour cream and stir. If the sauce is too thick, add water until desired consistency is reached. In a pot with enough water to cover, boil chicken breasts 25 minutes or until juices run clear. Drain, cool, and shred. Optional time-saver: shred a store bought rotisserie chicken. Fry tortillas in hot oil until softened. Drain on paper towels. Soften tortillas by soaking in sauce one at a time. Place softened tortillas on individual serving plates. Layer with cooked chicken, cheese, and onion. Repeat process for a total of 3 tortillas for each serving. Preheat oven to 350 degrees. Spread 1 cup of the sauce in an ungreased 9-by-13-inch baking dish. Fry tortillas in hot oil just until softened. Drain on paper towels. Fill with cooked chicken, cheese, and onion. Roll, placing seam side down. Pour 2 cups of the sauce over enchiladas. Sprinkle with crumbled queso fresco and bake until warm, about 15 minutes. Serve with a dollop of crema or sour cream and your favorite side dish. Yvette, I have always wanted the recipe for your magnifico enchiladas! Thank you for sharing!! Hola amiga! I just noticed I never replied to this comment. Shame on me! Did you ever attempt the recipe? 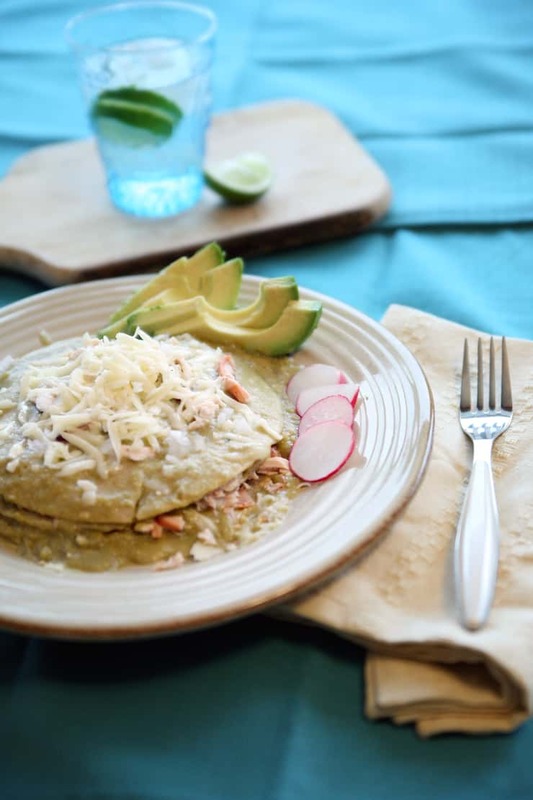 I’ve never tried enchiladas with white corn tortillas–always yellow. Whats the difference in flavor? Rachel: Its just a preference. I prefer Mission white corn tortillas for enchiladas. They are softer when fried, pliable, and easier to roll without cracking. I use the yellow corn for flautas or tostadas. This recipe has a great kick, but not too spicy. If you want to invite your sis-in-law, then spice it up by adding a roasted jalapeno or two 😉 Good luck with it! 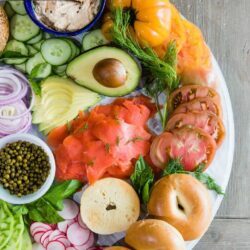 You have really fantastic recipes.I saw your blog from the foodie blog roll and I like what you have here.if you won’t mind I’d love to guide Foodista readers to this post.Just add the foodista widget to the end of this post and it’s all set, Thanks! Thanks for the compliments. I’ll look at Foodista and keep you posted. Gracias! Alisa: Please email me widget code and I’ll add it — Thanks! This enchilada recipe is the one and only. I substituted tofu, onion, and beet greens for the chicken — I am rarely a tofu fan myself but it works well here. Poblano chiles instead of anaheim, I couldn’t get anaheim, but still the heat was gentle enough for my 6, 5, and 1 yr old to all enjoy. Another non-traditional substitute was sprouted corn tortillas- gave the rolled style a bit more corn flavor and heft. Gracias muy bueno, I already emailed this recipe to friends who complain of being in a ‘rut’ cooking-wise. WOW, sounds like a great vegetarian alternative! Thanks for sharing your very unique substitutes and for sharing with your amigos — we appreciate the word of mouth. As a time saver, I used frozen, roasted and peeled green chilies from Whole Foods. All I had to do was thaw them and blend them with the buttermilk. It made this recipe super easy and still amazing! Everyone loved it! Can you eat the Suero de Sal by itself? Keep us posted Cena! Would love to know what you think! I’m glad you’re enjoying them. Just reading your comment makes me want some, especially on this cold and rainy day. I made this and it turned out excellent! My fiancé said that they where actually the best he’s had, which from him is a huge compliment. I will deff. be making this again. Making the sauce was all the difference too. Thank you for sharing! Gracias ourculinaryvenus!!! So glad you and your fiance enjoyed them. That recipe won my hubby over when we were dating. Its truly one of our favorites. Thank you for stopping by to leave a comment. I made this a couple weeks ago and it wasn’t that tasty. The reason is that I didn’t fry the tortillas and I forgot the queso fresco. I knew these were my faults and not fault of recipe, so I’m trying again tonight! I bought 12 Anaheims, for the occassion. However, I don’t see any point in washing the peppers throughly if I’m roasting and then taking skin off. So, I’m not doing that. I’ll rinse them, but not wash throughly. Okay I tried it again. I did everything right and there is still something missing. I think because there’s no salt in the recipe. I dunno. « Previous PostCalling for Cookbook Recipe Testers!